All meals onboard Great Southern, FREE beverages throughout your journey, FREE toiletries kit, Cabin Steward service, in-cabin music and commentary, use of "Outback Explorer Lounge"
The new Great Southern train is sure to become as iconic as it’s sister train journeys The Ghan and Indian Pacific, but will only operate for a very limited time during summer 2019-20. Enjoy the same private cabins, dining experiences and friendly crew aboard this completely new railway journey, that uses the same rollingstock as the long-established and popular Ghan and Indian Pacific. Experience the same hallmark quality of off-train activities and escorted touring across these new spectacular locations. The Great Southern is different in each direction. The Adelaide-Brisbane journey includes touring in The Grampians, Canberra and a special beachside dining experience on the Northern NSW Coast. Explore one of Australia’s most stunning wilderness regions, boasting sandstone mountains, wildflowers, waterfalls and native fauna such as echidnas and wallabies. There’s more than just politics in our nation’s capital. While the jewel in Canberra’s crown is Parliament House, it is also home to landmarks such as the National Portrait Gallery, Australian War Memorial and the National Arboretum. There are plenty of opportunities to delve into this city’s art, history and culinary culture. Enjoy brunch with stunning seaside views on the northern NSW coast - a stone’s throw from Coffs Harbour. The extended Brisbane-Adelaide journey gives you an extra night aboard the train and features a beachside dining experience on the Northern NSW Coast, as well as time spent in the stunning Hunter Valley wine region, regional Victoria and the incredible Twelve Apostles. You will be personally met at your hotel by a DISCOVER AUSTRALIA representative and transferred to the Great Southern railway station to begin your journey to Brisbane. Embark on the new Great Southern as you travel from Adelaide the 'City of Churches' to the vibrant city of Brisbane, marvel at the beauty passing by your cabin window, the rugged wilderness of the Grampians and rural Victorian countryside, the modern Capital of Australia and political hub Canberra, the stunning seaside vistas of the Northern NSW Coast and onto the youthful and vibrant cosmopolitan city of Brisbane. See below for full details on your Great Southern journey. Feel the youthful vibrancy of this modern forward-looking city as you arrive into Brisbane. You will be personally met at the airport by a DISCOVER AUSTRALIA representative and transferred from the airport to your hotel. You can relax and use the rest of the day to explore your hotel and its facilities, perhaps take a stroll around the neighbourhood and central Brisbane. 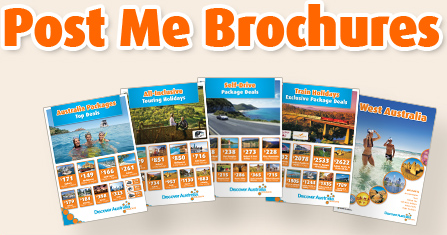 Meet and Greet Personalised Arrival Transfer, 2 Breakfast, 2 Lunch, 2 Dinner, Gold Service Cabin on the Great Southern, Off Train Experience The Grampians, Off Train Experience Canberra, Brunch in Northern NSW Coast, Meet and Greet Personalised Rail Transfer. Cosmopolitan Brisbane is home to lush subtropical parklands, a friendly welcoming ambience and a thriving cafe-culture. Meandering its way through this beautiful city is the enticing Brisbane River, the perfect companion for Brisbane's outdoor lifestyle. Australia's third-largest city is well known for its green leafy parks, urban inner-city villages, bustling streets, interesting laneways, art galleries, museums and South Bank with its lush riverside gardens, markets, and massive lagoon. Today we tour this energetic city, experience the iconic view from Kangaroo Point, cruise the Brisbane River and travel on the massive Wheel of Brisbane. As we tour through the main attractions, you will get a deep appreciation of Brisbane's rich history and see the spectacular architecture that characterises Queensland's capital city. Your friendly driver will pick you up in the comfortable air-conditioned luxury coach before sharing experiences, fascinating facts and enchanting stories in the onboard full commentary throughout the day. See Cathedral Square, Botanic Gardens (premier subtropical botanic gardens), pass under famous Story Bridge, see Parliament House, Conrad Treasury Hotel, Anzac Square, City Hall, Kangaroo Point Cliffs (amazing panoramic views of Brisbane's shimmering skyline and the river), cross Captain Cook Bridge and Story Bridge, tour through hip Fortitude Valley, Chinatown and see Queens Street Mall (main city shopping area). Onboard the Brisbane River Cruise you will travel through the scenic heart of the city, see the spectacular views of waterfront homes, the Brisbane skyline, South Bank parklands, cruise under Story Bridge and enjoy a delicious morning tea. The Wheel of Brisbane is one of the most exciting additions to the Brisbane City Skyline. Be inspired by the breathtaking 360 degree views right across the city. Travel 60 metres above the city in one of the 42 air-conditioned gondola capsules that seat up to 8 people. Don't forget your camera today. Luxury Day Tour with Hotel Pick-Up, Brisbane River Cruise, Brisbane Wheel, Morning Tea, Overnight Accommodation. Brisbane is abuzz with creative ways to spend your day. Soak up the subtropical climate, explore the river, botanical parks, museums, shopping precincts or South Bank, Brisbane's premier lifestyle and cultural destination. Explore Brisbane at your own pace. There is so much to choose from in this major city. The many major attractions include Queen Street Mall (vibrant shopping and lifestyle precinct lies at the heart of Brisbane), various markets, The Gabba, ANZAC Square War Memorial, City Botanic Gardens (Brisbane's oldest park, originally planted by convicts in 1825), Roma Street Parkland (spectacular subtropical plant displays, sweeping vistas and unique artwork), Queensland Museum and Sciencentre (home to millions of objects, specimens and artefacts that tell the changing story of Queensland), Queensland Art Gallery, Gallery of Modern Art (state's premier visual arts institution), The Courier-Mail Piazza (entertainment hub), Maritime Museum, Performing Arts Centre, Conservatorium and of course South Bank (17 hectares of lush parklands, world-class eateries, stunning river views and hundreds of delightful events all year round make it the perfect place to relax and unwind). Admire the remarkable colonial and modern architecture, including The Ship Inn (built in 1864), The Plough Inn (1885, part of World Expo 88 festivities), South Brisbane Railway Station, The Arbour, The Goodwill Bridge (450 metre long footbridge that links South Bank to the Botanic Gardens), Performing Arts Centre, State Library, Gallery of Modern Art (GoMA), Brisbane Convention and Exhibition Centre (BCEC) and River Quay. Perhaps follow the City Centre Heritage Trail (journey through a range of sites and events that have shaped Brisbane's history) or join an organised Guided Walk (guided walks that take you to some outstanding sights). You could also choose to spend time enjoying your hotel's great facilities. Time to say goodbye to beautiful Brisbane, your fellow travellers and friendly hotel hosts. You will be personally met at your hotel by a DISCOVER AUSTRALIA representative and transferred from your hotel to the airport to meet your flight home. Relax in your private Gold Service Cabin and watch the passing landscapes of Australia pass by through your large window. Enjoy all meals onboard the Great Southern in the stylish Queen Adelaide Restaurant Car (flexible times, hearty breakfasts, two course lunches, three course dinners). Your package includes FREE soft drinks, beers, high-quality standard wines, base spirits, tea and coffee throughout your journey on board. You will also receive a FREE toiletries kit. You have Cabin Steward service, in-cabin music and detailed journey commentary (available from your cabin sound system) and you will love the cosy but exclusive atmosphere of the Outback Explorer Lounge. Your package includes Gold Service but can be upgrade to Platinum Service. You have 3 choices of accommodation in Brisbane. Our "Good Standard" central Brisbane hotel has great facilities, a comfortable room and friendly service (typically 3.5 stars). Alternatively, why not treat yourself? The "Deluxe" hotel has superior facilities, stylish room and first class service (typically 4 stars). The “Luxury” hotel is upscale with a more luxurious feel for the discerning traveller and great for celebrating an anniversary (typically 5 stars). You will be personally met by a DISCOVER AUSTRALIA representative and transferred from the Adelaide airport to your hotel, from your hotel to the railway station and from the railway station on arrival in Brisbane to your hotel and from your hotel to the airport to meet your flight home. Be one the first to experience Australia’s newest railway adventure across three States. 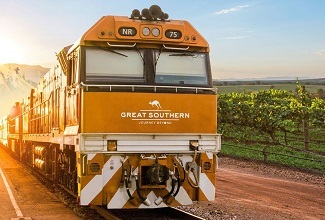 The Great Southern will operate for a limited time during summer 2019-20. Explore some of Australia’s most beautiful and remarkable destinations, including guided touring in the Grampians and Canberra with a memorable Northern NSW Coast brunch. Upgrade to the extended 3 night Brisbane to Adelaide direction journey for extra an day aboard the train with guided touring in Northern NSW Coast, Hunter Valley and Regional Victoria and Twelve Apostles. The new Great Southern train is sure to become as iconic as it’s sister train journeys The Ghan and Indian Pacific. Enjoy the same private cabins, dining experiences and friendly crew aboard the new railway journey using the same rollingstock as the long-established and popular Ghan and Indian Pacific. Experience the same hallmark quality of off-train activities and escorted touring across these new spectacular locations. Check-out the different off-train experiences on each direction of the Great Southern train. The Great Southern Train With Brisbane Discover is very popular. Many dates book out well in advance, please book soon.